In 2017 the International Drive Resort Area Chamber of Commerce launched the Harris Rosen Philanthropic Award. This award will be given annually to a business or person who exemplifies a person or company who demonstrates exceptional philanthropic work, making our community and the world a better place. 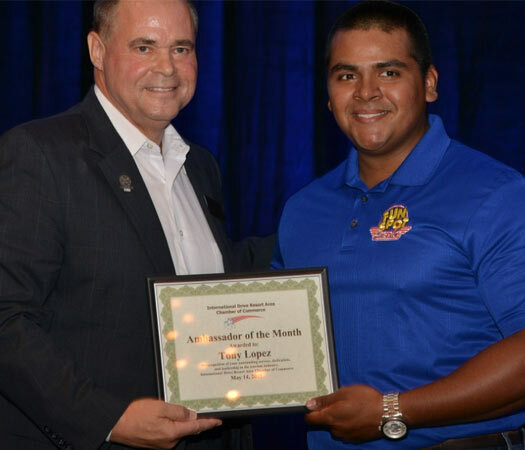 The Chamber’s Ambassador of the Month Program recognizes a front line employee who went out of his or her way to make a guest’s experience an exceptional one. The ambassador is honored at our general meeting luncheon for a job well done. The employee receives a certificate of appreciation along with a prize package including: 2 tickets to SeaWorld, Universal Orlando, Walt Disney World, Orlando Eye, Madame Tussauds, SEA LIFE, Fun Spot, I-Drive Nascar Race Car, Skeletons, a 3 day 2 night stay at Hyatt Place and a $50 gift card compliments of Orlando Federal Credit Union. 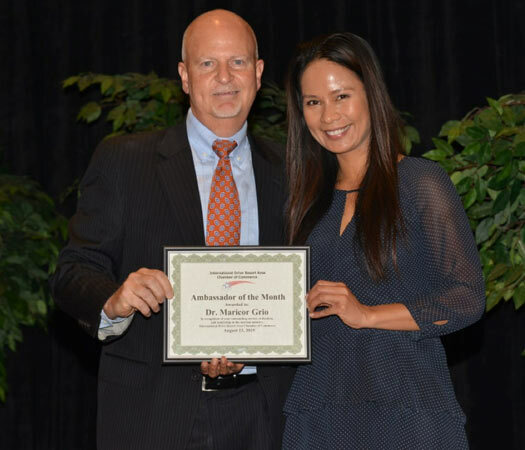 August 2015 Ambassador of the Month – Dr. Maricor Grio – Night Lite Pediatrics Presented by David Vallillo, General Manager Embassy Suites Jamaican Court, 2015 Chairman. June 2015 Ambassador of the Month – Lilyan Vock – Presented by David Vallillo, General Manager Embassy Suites Jamaican Court and 2015 Chairman of the Board. Presented by John Stine, Director of Marketing I-Drive 360 and I-Drive Chamber Board Member. 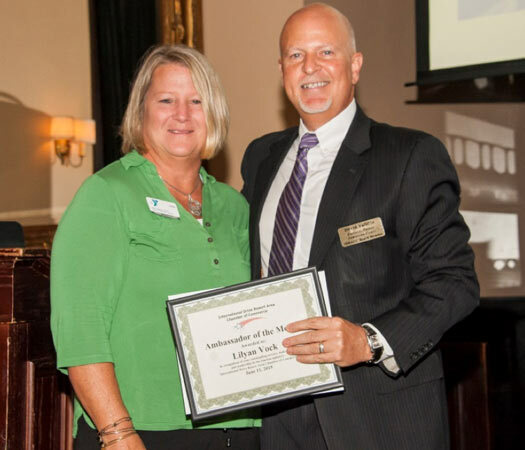 February 2015 Ambassador of the Month – Laurel Clark with Sleuths Mystery Dinner Theater. Presented by David Vallillo, General Manager Embassy Suites Jamaican Court and 2015 I-Drive Chairman of the Board. 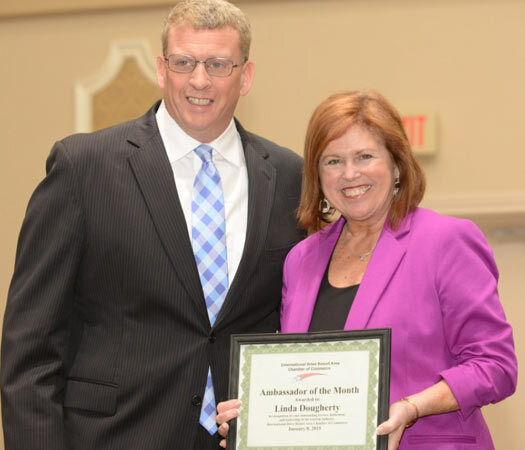 January 2015 Ambassador of the Month – Linda Dougherty with the Dougherty Group. Presented by Rich Larkin, General Manager of the Wyndham Orlando and I-Drive Chamber Board Member. 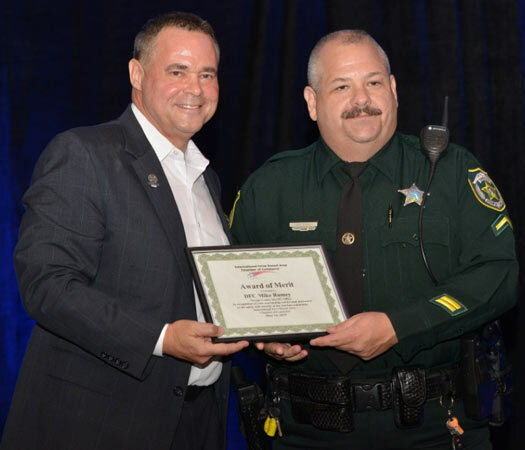 The Chamber honors an Orange County Sheriff’s Office Deputy every month and a Orlando Police Officer quarterly at our General Meeting Luncheons for their dedication to duty and dedication to the safety & security of our tourism community. The Deputy and Police Officer receive an Award of Merit along with a prize package that includes 2 tickets to SeaWorld, Universal Orlando, Walt Disney World, Orlando Eye, Madame Tussauds, SEA LIFE, Fun Spot, I-Drive Nascar Race Car, Skeletons, a 3 day 2 night stay at Hyatt Place and a $50 gift card compliments of Orlando Federal Credit Union. 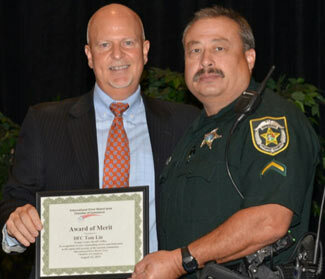 August 2015 Orange County Deputy of the Month – Deputy Tom Lin. Presented by David Vallillo, General Manager Embassy Suites Jamaican Court, 2015 Chairman. June 2015 Orange County Deputy of the Month DFC Cristian Readdy. Presented by Orange County Sheriff Jerry Demings and Chairman David Vallillo. March 2015 – Orange County Deputy of the Month Deputy Mike Ramey. Presented by John Stine, Director of Marketing I-Drive 360 and I-Drive Chamber Board Member. 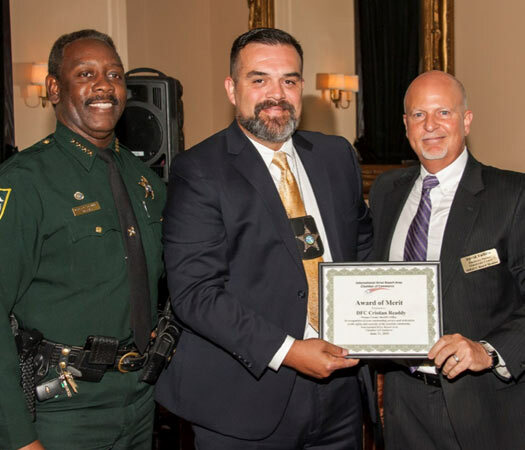 February 2015 Orange County Sheriff’s Office Deputy of the Month – Master Deputy Detective Dave Bareno – Presented by David Vallillo, General Manager Embassy Suites Jamaican Court and 2015 Chairman of the Board. 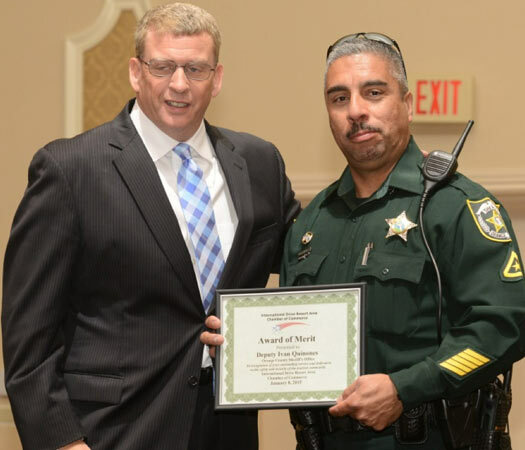 January 2015 Orange County Deputy of the Month - Ivan Quinones - Presented by Rich Larkin, General Manager Wyndham Orlando and I-Drive Chamber Board Member. 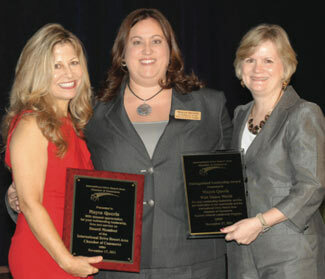 The Chamber’s Distinguished Service Award acknowledges the Orange County Sheriff’s Office and the Orlando Police Department for their strong working relationship with the Chamber and our tourism community. Jan Addison, Deputy General Manager of the Orange County Convention Center and I-Drive Chamber Chairman, awards Captain Gilles McDaniel, Orange County Sheriff’s Office with the Distinguished Service Award at the Annual Meeting Luncheon. 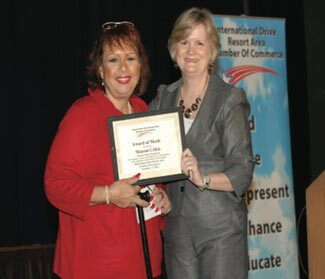 Jan Addison, Deputy General Manager of the Orange County Convention Center and I-Drive Chamber Chairman, awards Sharon Celcis, O.P.D. 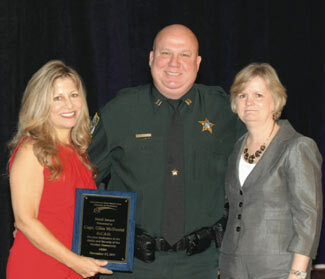 Crime Prevention Specialist with the Distinguished Service Award at the Annual Meeting Luncheon. The Chamber’s Outstanding Media Award recognizes members whose work has highlighted the success of the I-Drive Area and promoted positive images of our community. 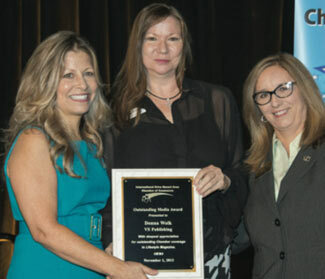 Donna Wolk, President of VS Media Group, Inc., was presented with the Outstanding Media Award for the media coverage VS Publishing provided the I-Chamber in Lifestyle Magazine. 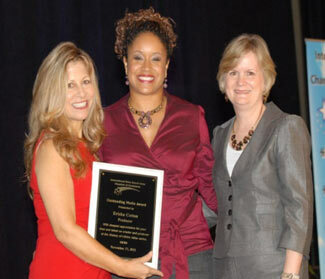 Producer Ericka Cotton, President/CEO Louder than Words Media receives Outstanding Media award for producing “The History of International Drive” video series and various other I-Drive productions. 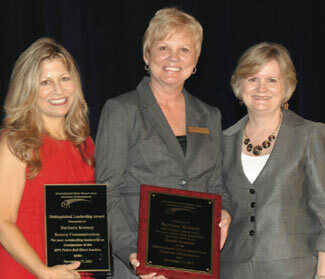 In 2006 the Chamber implemented the Distinguished Leadership Award. The Distinguished Leadership Award is presented at the Annual Meeting Luncheon to Chamber members who exemplify outstanding leadership and participation in Chamber programs, projects and events. 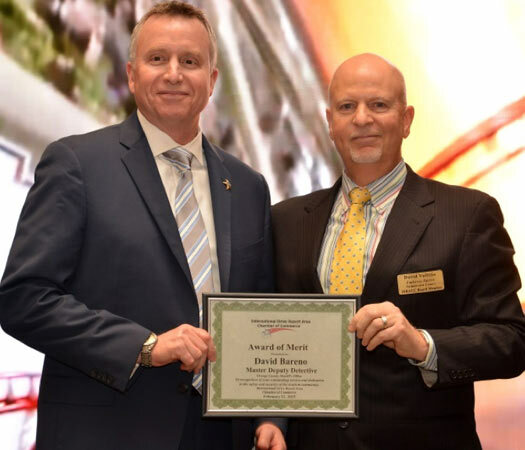 Steve Vinciguerra, Tourism Sales SeaWorld Parks & Resorts Orlando receives Distinguished Leadership Award for his support and participation in the Chamber’s Tourism Orlando Leadership program and SeaWorld host Luncheons. 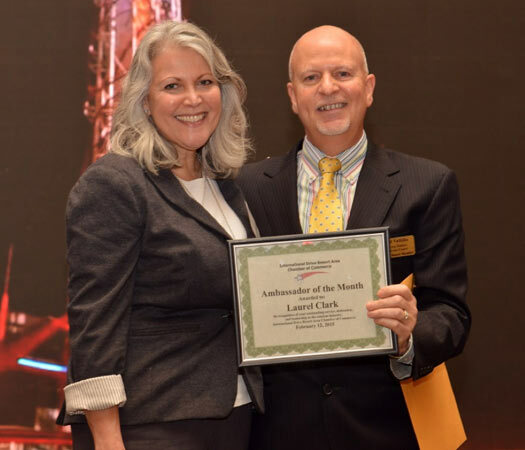 Dan Donovan, Sr. Director Universal Orlando, receives Distinguished Leadership Award for his support and participation in the Chamber’s Tourism Orlando Leadership program and Universal host Luncheons. 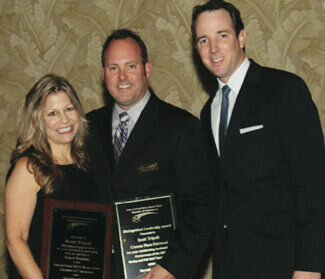 Barbara Kenney, Kenney Communications receives Distinguished Leadership Award for Chairing the Chamber’s Annual Police Ball silent auction. Scott Tripoli, Crowne Plaza Universal, receives Distinguished Leadership Award for Chairing the Chamber’s 24th Annual Golf Tournament. Mayra Queris, Walt Disney World receives Distinguished Leadership Award for the Chamber’s Tourism Orlando and Walt Disney World host luncheons. 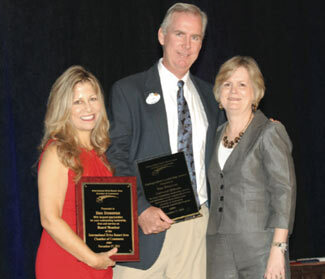 The Visionary Leadership Award was first presented in 2010 to recognize an outstanding Chamber member whose vision made a tremendous impact on the International Drive Resort Area and our Tourism industry. The Visionary Leadership Award was created to acknowledge these individuals for their tenacity, dedication and ability to turn vision into reality. 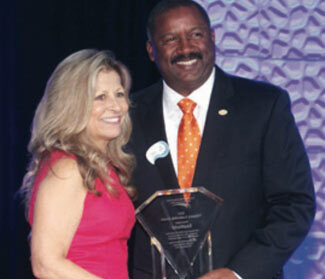 Terry Prather, SeaWorld President accepts the Chamber’s 2014 Visionary Leadership Award on behalf of SeaWorld. The Chamber awarded SeaWorld with its highest honor for its vision, leadership and helping to make Orlando a World-class resort destination. 2013 Visionary Leadership Award Recipients was Mr. Harris Rosen and Dr. Abe Pizam Dean of the UCF Rosen College of Hospitality Management. The award was presented for their vision, leadership and contribution to the establishment and success of the UCF Rosen College of Hospitality Management. 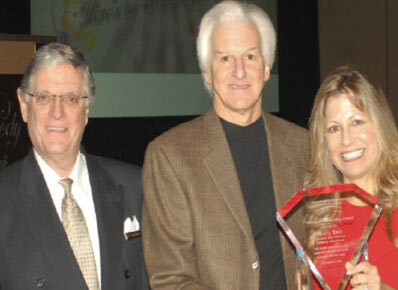 Harris Rosen, Kelly Smith and Jim Brown are presented the 2010 Visionary Leadership Award at the Annual Meeting Luncheon for the key role each played in the development and success of the International Drive Resort Area. 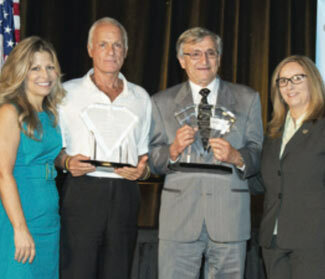 2011 Visionary Leadership Award was presented to Marty Belz, President & CEO of Peabody Hotels for his vision and leadership in the development of the Peabody Orlando. 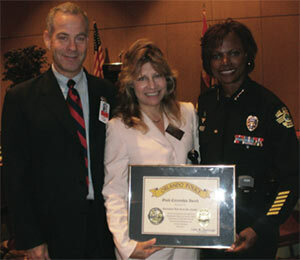 Orlando Police Chief Val Demings, Awards the International Drive Resort Area Chamber of Commerce with the Orlando Police Department’s Good Citizenship Award for outstanding community partnership. Sheriff Demings awards the Chamber with the Orange County Sheriff’s Office Community Service Award for the Chamber’s dedication and outstanding leadership in partnering with the Orange County Sheriff’s Office on crime prevention programs. 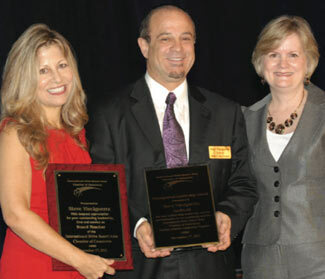 In 2001 the International Drive Resort Area Chamber of Commerce received the Orange County Sheriff’s Office Citation for exemplary work in crime prevention programs.